to the dawn of motorcycle culture as it’s known today. 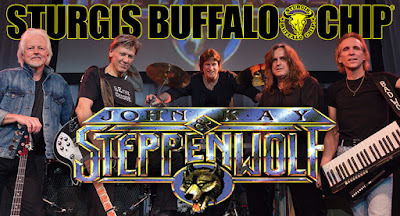 Sturgis, SD – Motorcycle and music fans will have the chance to see true living legends at the Sturgis Buffalo Chip this August when John Kay and Steppenwolf bring their heavy metal thunder to the Wolfman Jack Stage on Friday, Aug. 10. Steppenwolf changed the rock ‘n’ roll landscape and the world of motorcycling forever. Their songs featured in the biker culture classic “Easy Rider” became synonymous with riding and rebellion. The official announcement video can be seen here: www.BuffaloChip.com/BANDS. Steppenwolf is the original biker band and is credited with spawning an entire genre of music when singer John Kay coined the term “heavy metal” in the lyrics “heavy metal thunder”. The band’s music gave the world of motorcycling the impetus for many a road trip with anthems that include “Born to be Wild” and “Magic Carpet Ride.” Classic hits like “Rock Me,” “The Pusher” and “Jupiter’s Child” became engrained in the hearts of bikers everywhere. The headlining performance by John Kay & Steppenwolf is the most recent of three huge names to sign on to perform at the Buffalo Chip in 2018. Eric Church is scheduled to perform Wednesday, Aug. 8 followed by Kid Rock on Thursday, Aug. 9. Many more world-class bands will be announced soon.